In the 1943 animated short Dumb-Hounded, Tex Avery debuted a new character, a laconic, quick-witted, slow-talking hound dog. Originally dubbed “Happy Hound” (though this is never explicitly mentioned onscreen), the dog spends the entire cartoon tracking down a wolf who has escaped from jail, remarkably appearing in every locale to which the wolf attempts to escape. From the city to the remotest areas of the planet, there is nowhere the wolf can go where Droopy isn’t waiting for him, and every encounter with his would-be captor sends the wolf into frenetic takes marked by incredibly imaginative imagery. Eventually christened “Droopy,” this seemingly mild-mannered, deceptively meek character became the perfect vehicle through which Avery could explore the wildest gags he could possibly conceive. Pint-sized though he may be, Droopy is clever and strangely strong, eventually besting his challengers. Droopy’s practically magical ability to pop up everywhere and anywhere in his cartoons is reminiscent of Cecil Turtle, a character Avery developed while working for Warner Bros., who became Bugs Bunny’s incongruously speedy nemesis in Tortoise Beats Hare (1941) and its two sequels. But while Cecil’s tricks are obvious to the audience, Droopy’s constant popping-up where he shouldn’t be adds a level of “how-does-he-DO-that?” mystery to the character. And while the gag could grow old after a while, it’s the myriad of ways in which his opponents, like the unnamed wolf characters or Spike the bulldog, react to seeing him that really makes this recurring element feel fresh in every cartoon. In Dumb-Hounded, Droopy’s design is more like that of a traditional dog a la Disney’s Pluto, though unlike Pluto, Droopy actually speaks (mumbles) in a somewhat lethargic tone. In his next cartoon, however (1945’s The Shooting of Dan McGoo), the design has been refined to make Droopy a more anthropomorphized figure–he stands upright on his hind legs and walks around like a human, much like Disney’s Goofy or Warner’s Bugs Bunny. This ultimately provided more possibilities for the character in future cartoons, allowing Droopy to take on roles such as gunfighter, cowboy, or even matador, as his movements were no longer limited by a traditionally four-legged stance. Dumb-Hounded was remade in 1945 as the fourth entry in the series, called Northwest Hounded Police. Working with a skilled animation team that once again included frequent colleagues Preston Blair and Ed Love, Avery put together one of the strongest entries in the Droopy filmography. Here we see Droopy solidly established in his new design. This time around, the recycled gags are sharper and crisper, the reaction shots of the wolf even more exaggerated than before. Avery reuses that fantastic gag from Dumb-Hounded in which the wolf skids off the screen, momentarily exposing the side of the film strip before jetting back into the action, and then takes the meta references up another notch by having the wolf attempt to hide in a movie theater–before Droopy appears onscreen and singles him out in the audience. It’s all-out insanity crammed into seven minutes of sheer cartoony goodness, and far exceeds its predecessor in both production and laughs-per-second. A great deal of the humor in the Droopy shorts comes from the dog’s voice, which is almost painfully deadpan. Bill Thompson provided the voice of Droopy in most of the theatrical cartoons, having been part inspiration for the character in his radio role Wallace Wimple on the popular program Fibber McGee and Molly. But during World War II, when Thompson was enlisted in military service, Tex Avery himself voiced Droopy in three cartoons: Dan McGoo, Wild and Wolfy, and Northwest. So seamless is Avery’s delivery that it’s difficult to tell the difference between his vocals and Thompson’s! For his part, Thompson was an adept voice-over artist; not only had he provided the voice of the pseudo-Hitler wolf in Avery Blitz Wolf, but he also played several famous supporting characters for Disney, including the White Rabbit in Alice in Wonderland; Smee in Peter Pan; and five different parts, including Jock the Scottie, in Lady and the Tramp. 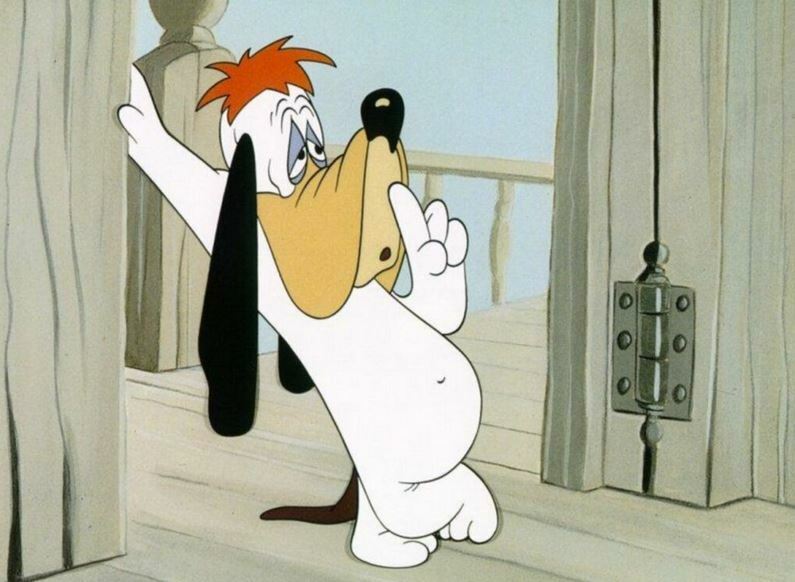 Over the course of nearly two decades, Droopy would become one of the most popular recurring figures in the MGM animation lineup (behind perennial breadwinners Tom and Jerry), eventually appearing in twenty-four cartoons for the studio. Avery directed sixteen of these alone, and co-directed one with Michael Lah, who took over the series in 1957. The final Droopy theatrical short, Droopy Leprechaun, was released in 1958, well after Avery had left MGM. Though the Droopy series was rather short-lived in comparison to the run of other notable characters from the Golden Age of Hollywood animation, Droopy remains one of the most memorable animated figures from that era, if only for Thompson’s truly distinctive vocal characterization and the wall-to-wall gags that to this day remain some of the most entertaining and outrageous visuals ever conceived for any cartoon. Don’t forget to enter our awesome Tex Avery prize pack giveaway (details here)! Droopy was my introduction to Bill Thompson, who was one of radio’s great character players. I heard him as Droopy, but he also used the same voice for Hanna-Barbera’s Touche Turtle. Both of these cartoons are hilarious and brilliant, but in the later “Northwest Hounded” the actual animation–the “extremes”–is finally as wild as the gags. I enjoyed both, but the second still made me laugh out loud, despite having seen it many, many times before. Interesting observations and trivia; I had no idea Tex ever did the voice. Watching the cartoon again, it’s pure comedy genius. But in my childhood I was a little afraid of Droopy and his stone face. Thniking well now, he’s some kind of Buster Keaton of the cartoons! Le’s description of Droopy as the Buster Keaton of cartoons is so good! I love Droopy, and I don’t think I’ve ever had the chance to introduce him to my grandkids. I’m going to use your clips to do it!